Your new PC came with Vista. Maybe your office deployed Vista. Or, perhaps, you got caught up in the early hype and bought Vista. Whatever the case, now you're stuck with it. Wish you could turn back the clock and restore your beloved Windows XP? Unless your name is Marty McFly, you're outta luck. But all is not lost: You can give Vista an extreme interface makeover, tweaking it to resemble XP. Just because you're stuck with Vista doesn't mean you have to look at it all day. Strictly speaking, you still have a few ways to get your hands on XP if these makeover tips don't satisfy your thirst for the older version of Windows. While supplies last, you can find boxes of XP on some retail shelves. And some system manufacturers offer XP downgrades with the purchase of a Vista Business or Ultimate license. However, if you're not interested in scouring the earth for one of the last remaining boxes of Windows XP, or if you don't feel like jumping through hoops to buy a version of Vista that comes with an XP license, the following tricks will go a long way toward making you feel more at home in Vista. Disable Vista's Aero graphics to speed up Vista and make it more XP-like. Sure, Vista's much-ballyhooed Aero Glass&#160;environment makes the OS look pretty, but at what cost? To XP die-hards, the translucent windows amount to little more than system-slowing eye candy. To make your machine look and feel more like XP, and to improve its performance in the process, you'll have to break through the Glass. Start by right-clicking any empty area of the Desktop, and&#160;then clicking Personalize in the context menu. Next, click the Window Color and Appearance option. Clear the Enable Transparency check box and click OK. Presto: solid, XP-like windows and a zippier PC. The Windows Standard theme is more Windows 2000 than Windows XP, but at least it's not Vista, right? Don't like Vista's fancy-schmancy colors, buttons, and fonts? You can easily switch back to a more XP-esque theme. 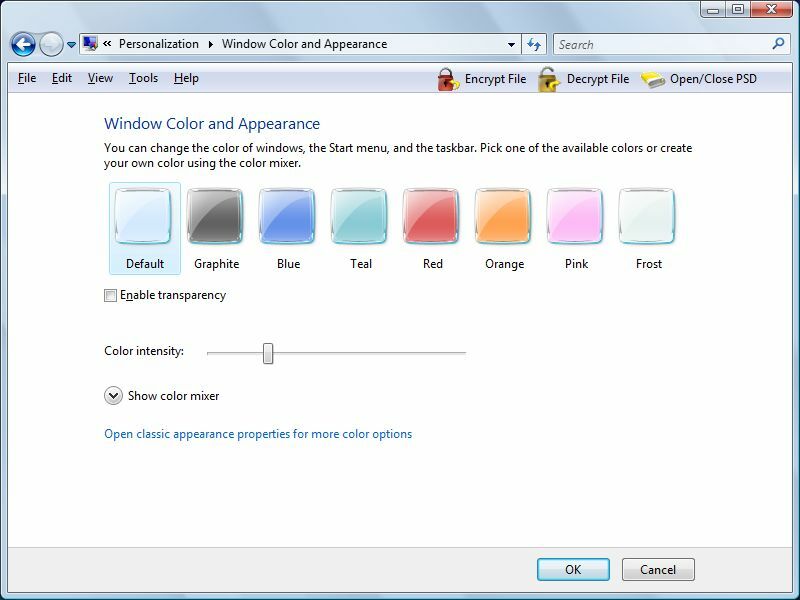 Head to the same Window Color and Appearance option as in the last step, and click the link marked Open classic appearance properties for more color options. 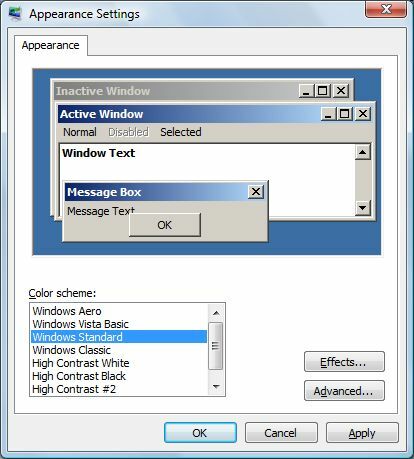 In the 'Color scheme' box, choose Windows Standard, and then click OK. Wait a minute while Vista undergoes its XP transformation. When it's done, you'll see a familiar-looking Start menu, taskbar, and so on. Stardock's WindowBlinds includes an excellent Windows XP-style theme, but for a price. Careful observers will note that the above option implements more of a Windows 2000 look than a Windows XP style. For maximum XP-ness, call in outside help: Stardock's WindowBlinds. 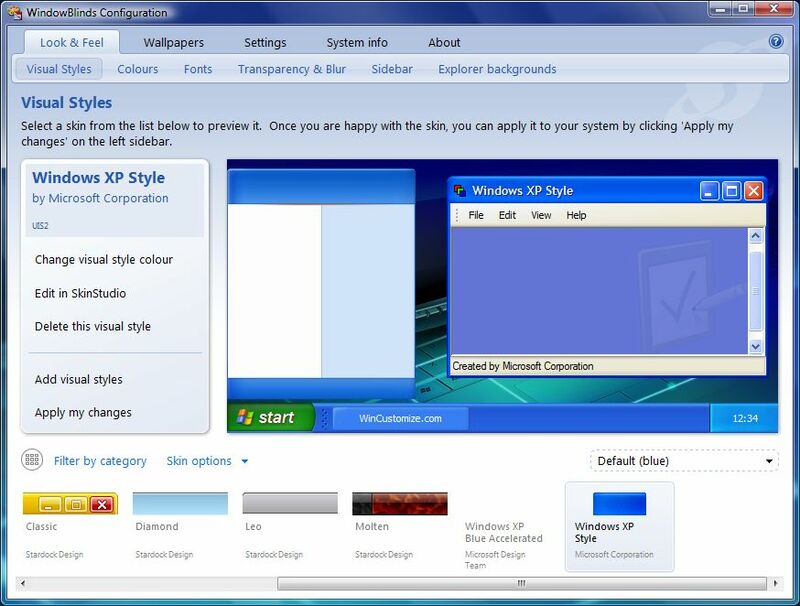 This $20 utility lets you tweak just about every aspect of Windows' appearance or choose from hundreds of user-designed themes--including the aptly named Windows XP Style, a veritable doppelganger of XP's classic Luna theme complete with a big green Start button.